Sawbuck is a term used to describe a framework to hold logs. 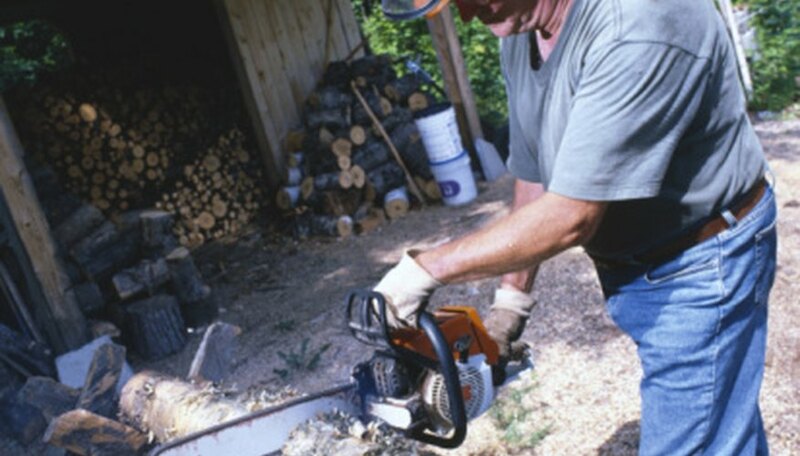 You place the log in the sawbuck to make it easy to cut up with a chain saw. Sawbucks hold the log up off the ground so you don't have to bend over when cutting firewood. It makes it safer and faster. You can make a sawbuck out of ordinary 2-by-4 studs, a few screws and a cordless drill. Lay one stud down on top of another stud to make an "X" on the ground. The top of the "X" arms should be spread apart 24-inches. Drill four holes with the cordless gun into the joint where the studs meet at the intersection of the "X." Insert screws into the holes. Screw the two arms together using the screw gun and Phillips tip. Repeat step one with two more studs to produce two "X" frames. Stand the two frames up on their feet, 48 inches apart. Use an assistant to hold both "X" pieces up while you place another stud flat on the bottom angled leg half-way up from the bottom foot to the intersection of the "X." Drill four holes into the stud. Insert screws into the holes and screw the stud to the "X" to make the first brace. Spin the "X" frame around and screw another stud to the other side opposite the first brace. Flip the frame upside down and screw two more braces on the legs in the same positions as you did to mirror the first two braces. The sawbuck is symmetrical and can be used either way. The measurements here are for examples to cut moderate sized logs. You can build a sawbuck with heavier lumber for bigger logs.